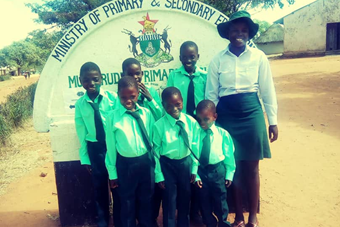 Working in partnership with Mpfurudzi Primary school and local councillors and village heads, we support about 15 children of whom 12 are in school. We also identified the school’s need for a library to enhance children’s literacy and reading skills. We delivered about a thousand books and 12 children’s learning computers. We are currently fundraising for the construction of a library and computer room. This project is estimated to cost about $20 000.00. The school has raised $10 000.00. New Hope Kingdom Kids Relief Fund is also raising money to construct a children’s home and learning centre 5km from the school. Most of our children do not have decent homes and its too costly to support each one of them individually on a daily basis hence the need to construct a home which would be a relief to the guardians. We have purchased an 8-acre plot to this effect. Our Zimbabwean team is working very hard towards this project through the sell of donated clothing. They have raised $7000.00 out of $30 000.00 initially needed. Our UK team has sent them $7 000.00 to purchase building material and pay the builders. If you feel you want to be part of this vision, you can donate through our UK account. Thank you in advance .